Hibs head coach Alan Stubbs and striker Jason Cummings have been named the Ladbrokes Championship manager and player of the month for October respectively. The Easter Road side are unbeaten in 12 matches and haven’t suffered defeat since August when a James Tavernier free-kick was enough to give Rangers all three points at Ibrox. Since then, Hibs have won eight out of nine matches in the Championship, their only blip coming in the form of a 1-1 stalemate at home to Ian Murray’s St Mirren in September. Hibs are now just five points adrift or Rangers at the top of the table. Stubbs has also led his side to the League Cup semi-finals, with victories over Premiership outfits Aberdeen and Dundee United. 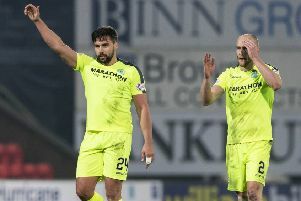 Striker Cummings, meanwhile, has netted in each of Hibs’ last six matches and is the second top-scorer in the division with eight league goals so far this term. The last occasion the Scotland Under-21 internationalist didn’t find the net was in the home draw with St Mirren in September.